We advocate the adoption of evidence-based health policy and work to ensure that the views and experiences of physicians are taken into account by policymakers throughout the UK. 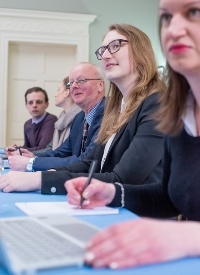 We meet regularly with elected representatives and other stakeholders on a cross-party basis to improve wider political understanding about the pressures within medicine. We also provide a strong voice within the Academy of Medical Royal Colleges. We also regularly respond to medical and health-related policy consultations on behalf of our Fellows and Members throughout the UK. These documents set out the College’s healthcare priorities and calls on elected representatives to implement measures relating to health and wellbeing, workforce planning and training, and the integration of health and social care.